It prompted her credit card company's fraud team to stop the payment going through, and text her about the more than £1,000 bill. Ms Gordon said Asda has apologised for the "computer error". "I told my seven-year-old 'you must really enjoy this banana, you must cherish every mouthful'," she said. Ms Gordon said she and her husband were baffled when they saw their bill, and did not anticipate the ensuing banana drama. "We thought it was just a silly mistake and they couldn't possibly be charging us for it," she said. "But then we got a text from my credit card company saying they detected fraud and that they had tried to charge me for it." A spokesman for Asda apologised, saying it "slipped up" with the bill. 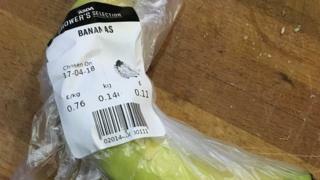 "Whilst our bananas are excellent, even we agree that they are not worth that much and clearly there has been a glitch in our system," they said.